This is known as a Lutari Talisman. Talisman usually refers to an object that can be charged with magical powers. 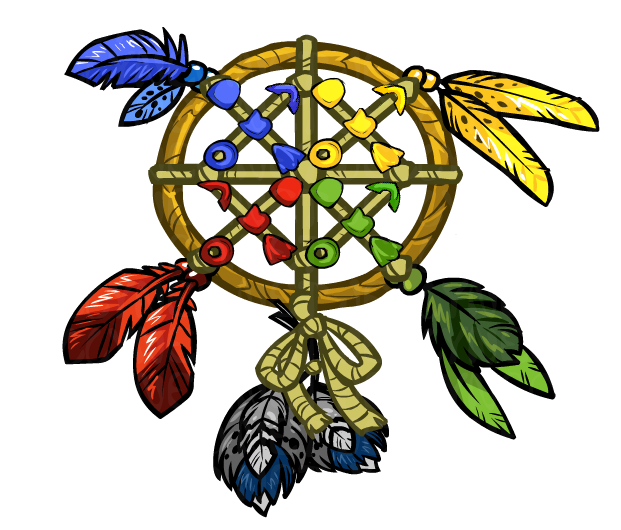 The Lutari Talisman, loosely based on the Native American dreamcatcher, can store several magical beads. While these beads are quite expensive (to the point of not being cost-effective), they might just bring you some good fortune while playing Neopets! Note: While the icon appears on everyone's lookup, only you can see your particular talisman. You must place a bead on your Talisman in order for the bead to work. To put a bead onto your Talisman, click on it in your Inventory. There will be an option there for you to move the bead over. You can only place one bead of each kind on your Talisman. Once attached, they can never be removed. As you can see, the beads in your inventory look the same by themselves as they do on the Talisman. There is one glitchy exception to this rule: when placed on the Talisman, the red Tongi bead will appear as a red Matu bead and vice-versa. Nobody is quite sure why this happens; one can safely assume it is a harmless glitch. The Lutari Talisman was originally a feature of Lutari Island. This land was in turn part of Neopets Mobile, a service that allowed users of certain mobile phones on certain carriers (mostly in the US, but sometimes abroad) to access a special version of Neopets on their phones. If a user referred a friend to Neopets Mobile, both the user and their friend were rewarded with a Talisman bead when their friend signed up. Neopets Mobile was discontinued in June 2009 and this method of obtaining beads disappeared with it. Currently, the only way to get beads is by purchasing them from other users on the Trading Post. They were previously given out by random events as well, but were discontinued with the revamp. It is worth noting that the Tongi beads were originally only available by way of referrals. The exact effects of each bead have never been revealed by TNT. The official descriptions of each bead are as follows: red beads bring strength, green bring luck; blue bring diplomacy and yellow bring speed. Red beads appear to result in shop discounts when haggling at Neopian shops (not user shops). Evidence suggests one red bead equates to a 2% discount; two red beads a 4% discount; three beads, 6%; four beads, 8%; and five beads, 10%. Green beads result in Neopoint game bonuses . When sending your score after a game, occasionally your Talisman will randomly increase the neopoints you receive. One bead will grant you a 10% increase in neopoints, two beads 25%, three beads 50%, four beads 75%, and five beads 100%. they increase the chances of semirandom avatars such as Edna - Cackle! and Snowager - Rawr! One JN Staff member reports being awarded game bonuses with only yellow beads on his talisman. However, both solsticesprite's and chaosrocket's research consistently report that green beads are required for game bonuses. It's possible that TNT has changed the properties of blue and yellow beads. It's even possible TNT never activated them, and they do nothing.